I speak on behalf of CETIM and the Global Campaign to dismantle corporate power, a global network representing more than 200 movements, organizations, trade unions, peasant organizations, communities affected by the activities of TNCs and many other sectors from all over the world. As you all know, TNCs have become major actors of the current economic system, and their activities are often source of multiple human rights′ violations. These entities benefit from a range of binding trade and investment instruments that protect their interests. Thanks to their transnational character, their economic and legal versatility and their complex structures, TNCs escape all legal and democratic control. 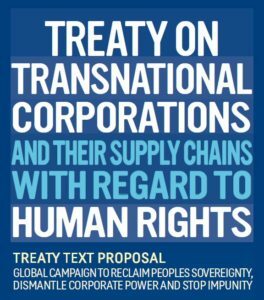 It is hence essential that the instrument establish binding obligations for corporations and that States enforce the primacy of international human rights legislation over all other trade and investment rules. We would like to congratulate the Presidency of the Working group for its leadership and for having conducted in a transparent and constructive way this historical process. After three years, the momentum has come to enter into the core of the negotiations in order to move forward to the elaboration of this highly needed instrument. In this regard, we expect the publication of a Zero Draft Treaty four months before the next session, in compliance with the commitment taken by the Presidency during the last session of the WG last October. In regard to this Zero Draft, we expect it to be build on the bases of the “Elements document” that was presented during the last session of the Working group and which provided a good basis for discussion and negotiation. Moreover, we would like to caution the fact that the process must be protected from corporate capture and we would like to emphasize once again the need to provide a framework in which CSOs, in particular victims and affected communities, are able to inform and participate effectively. We call on all states to engage constructively in the upcoming steps of the process and to contribute to its final success. As a matter of fact, for now more than 40 years, all attempts within the United Nations to establish binding regulations of the TNC activities have been diverted. This working group may be the last chance to settle the current latent conflicts and the growing impunity of TNCs in regard to human rights violations. This may also be the last chance to restore people’s and citizens’ confidence in political institutions and to enable States, themselves often victims of TNCs, to regain their sovereignty. Finally, we allow ourselves to recall that all the activities organized in the framework of this Working Group must comply with the mandate given by the Human Rights Council through the Resolution 26/9.